Although fluor is best efficient on non-porous enamel surfaces, it cannot counter enamel structural defects. Pit-and-fissure sealants protect occlusal surfaces of posterior teeth where fluor is not particularly effective. 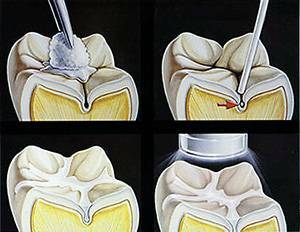 Sealants are therefore applied as soon as possible after the eruption of the tooth. Studies have shown that for kids under 15, 4 caries lesions out of 5 develop on the chewing surfaces of the molar teeth. Plaque builds up on the fissures of these surfaces and cannot be removed even with thorough brushing, the brush bristles being a diameter greater than the width of a fissure. Sealants must be checked on a regular basis and reapplied if necessary. Untreated dental problems can also disrupt a child’s development as he will smile less and withdraw from his social circles. Too often neglected, a child’s dental condition still contributes to the problem of school absenteeism.